It's going to be a nostalgic week, folks. We're closing in on a full year of marriage. It's weird that we've been married long enough to have mustard in the fridge that is too old to eat. It's weird that we have a fridge. And an apartment. And a dog. I mean, obvisouly, I'm glad we have all those things, well maybe not the old mustard, but you get it. 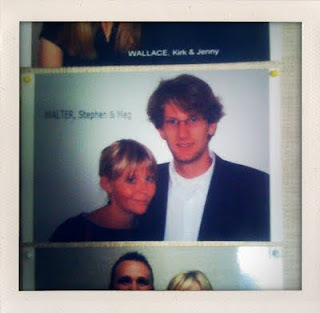 It's just still surreal that I'm a wife with a husband, and we as husband and wife have a photo on our ward bulletin board. It's surreal after nearly a year. Is that normal? Or do I have prolongedsurrealismosis? Is there a medication for that? I'm sure you'll be able to diagnose me in a few years when I'm still drowning in debt. I'll hardly believe it's still possible. it still feels surreal to me, even after two years. i'm not sure i'll ever get to used to being called a wife or mrs. clawson. but its nice that after two years, it still feels fresh and new. there is a medication for that, but i think it's illegal in the united states. I'll be in my own debt denial. I have yet to be called Mrs, Walter, but I'm looking forward to it. i am proud of you for taking a picture of your picture on the ward bulletin. Tallia, Alpha took the picture when she was in town. Sorry I let you down. Dad, it's true. I'm growing too fast.